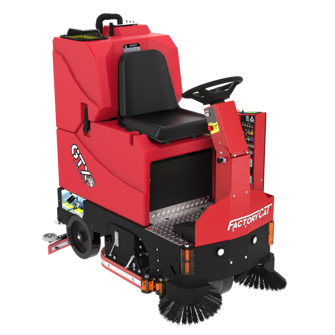 With a 57” turning radius and side brooms to sweep up against walls and under racking, the GTX is the ideal scrubber even for tight aisles and smaller areas. The unique tanks are designed for easy access and hygienic clean out. 33 gallon solution capacity extends scrub time between re-fills and the optional spray hose can be used to clean out the dirty tank, or for spraying in corners or difficult to reach areas. The Factory Cat GTX can be equipped with three different scrub systems: disc brushes, cylindrical brushes, or the Edge square scrub head. 25” to 34” scrub paths let you design a scrubber that fits your needs. The GTX offers a variety of options so you have the most tailored machine to clean your specific floors. Common options include front side brooms, heavy duty side doors, vacuum wand, spray hose, no- marking tires, work lights, and many more. This Factory Cat battery floor scrubber offers similar features of the other Edge scrubbers, but in a rider platform. The GTX makes an excellent daily scrubber and uses 70% less water/soap to increase your cleaning productivity. Even more, you’ll improve floor conditions with a high-quality machine that promises simple maintenance and service.